Do you enjoy ice cream cones or cupcakes more? Why pick! May 11th is National Eat What You Want Day and we are ready to celebrate a day of eating with no regrets with a tropical treat hybrid. 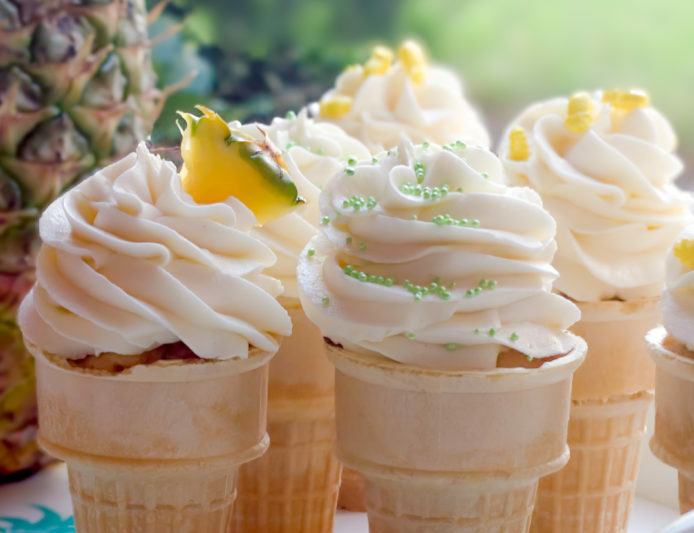 On this day of indulgence, we’re reaching for a Pineapple Ice Cream Cone Cupcake without remorse. The crunch of the cone mixed with the light, moist cake and pineapple-infused icing will have you feeling like life is sweet! Preheat the oven to 350ºF. Place 12 cones in a 9×13 metal baking dish standing up. In a medium mixing bowl, combine the flour, baking powder, and salt. Stir with a whisk to combine. Set aside. In a separate mixing bowl, beat the butter on medium speed until creamy. Add the sugar, continue to beat for 3 minutes. With the mixer set to low, beat in the vanilla. Beat in the eggs, one at a time, mixing well after each addition. Beat in the crushed pineapple and its juice. Add the flour, mixing just until combined. 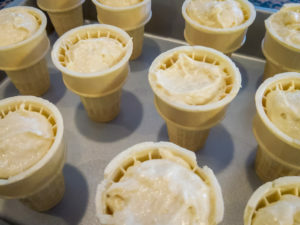 Divide batter evenly among the ice cream cones to fill them. Bake for 15 to 20 minutes or until a wooden toothpick inserted into the centers comes out clean. Cool the cupcakes in the pan while you prepare the pineapple frosting. Pour the 8 ounces of crushed pineapple and its juice into a food processor. (Or a Frozen Concoction Maker, whichever is more accessible) Process until finely pureed. Transfer to a small saucepan and bring to a boil over medium-high heat. Reduce heat to medium-low and simmer, stirring occasionally, until the mixture is reduced. Set aside to cool completely. In a stand mixer fitted with a paddle attachment or with an electric hand mixer, beat the butter on medium-high speed until smooth. Add the vanilla and salt. Continue to beat until incorporated. Add 2 cups of confectioner’s sugar and meringue powder, beat on medium-low speed until most of the sugar is moistened. Gradually add in the remaining sugar, one cup at a time. You may need more or less depending on how soft the butter is. Beat on medium-low speed until the sugar is moistened. Turn the speed up to medium-high and beat until light and fluffy. Scrape down the sides of the bowl as needed. Add the pineapple puree and beat until well combined. Garnish with a pineapple wedge and/or sprinkles.